Democratic U.S. Sen. Tammy Baldwin has defeated Republican state Sen. Leah Vukmir for another term in the U.S. Senate. The Associated Press called the race at 8:48 p.m. Baldwin claimed victory earlier than that, though, after several news outlets predicted Baldwin's win minutes within polls closing at 8 p.m.
Baldwin celebrated her victory at the Monona Terrace in Madison with supporters — including family, friends and lawmakers such as U.S. Rep. Mark Pocan, and former state representative and failed gubernatorial hopeful Kelda Roys. In her victory speech, Baldwin slammed special interest groups and the millions of dollars of outside money that flowed into the race. 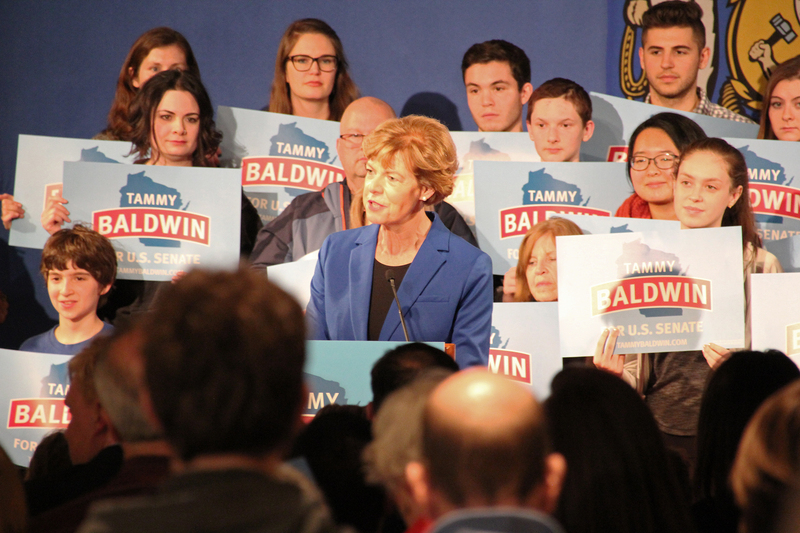 "Across our state, Democrats, Republicans and independents sent a loud and clear message: they wanted a senator who works not for the special interests, but someone who works for you," Baldwin said. Baldwin was first elected to the U.S. Senate in 2012, becoming the first openly gay senator and becoming Wisconsin's first female U.S. senator. Before 2012, she served in the U.S. House of Representatives and the Wisconsin state Assembly. Baldwin said Tuesday night that she will continue to work across the aisle to continue "doing right," a phrase the senator used multiple times in her victory speech when talking about passing legislation that benefits veterans, the economy, workers and Wisconsin farms and businesses. "In Wisconsin we believe that we’re all in this together, and that’s what this campaign has been about," Baldwin said. "For us it wasn’t simply a political fight, it was a fight about doing what’s right; and for me, it’s always been about doing right by Wisconsin." Throughout the campaign, Baldwin and Vukmir have clashed on immigration, health care and other hot-button issues. During the campaign, Vukmir criticized Baldwin for her response to the 2015 scandal at the Veterans Affairs Medical Center in Tomah. Vukmir, a nurse, was elected to the state assembly in 2002 and the state Senate in 2010. Vukmir and Gov. 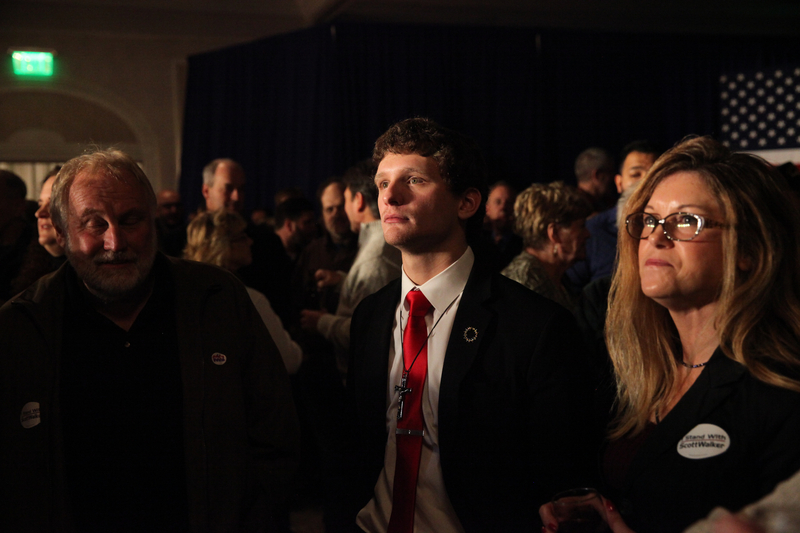 Scott Walker were at a joint election night party at the Ingleside Hotel in Pewaukee. Wisconsin Attorney General Brad Schimel, who is the incumbent in his race against Democrat Josh Kaul, was at the same hotel, but in a different room for his election night party. 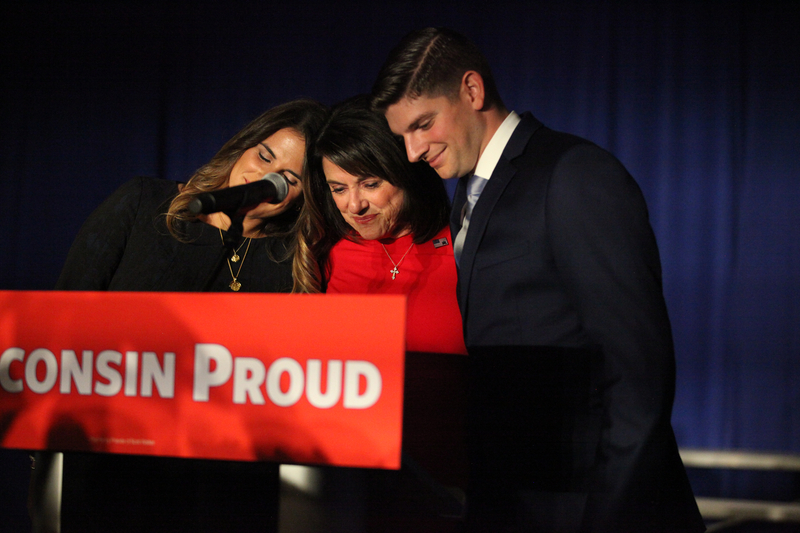 Vukmir gave a short, emotional concession speech at around 9:45 p.m., thanking her supporters. "We ran a pretty hard race, and we ran a race as hard as you could run in Wisconsin, and I'm proud of the race we ran," Vukmir said. Baldwin ran a "hard race," Vukmir said, adding that Vukmir's campaign ran as the "underdog." "I wouldn't change anything over the last few months," Vukmir said to the crowd. When Baldwin's victory speech was played at the Vukmir-Walker rally, music was turned up even louder to mask the sound of the speech before the audio of speech was turned off all together. Editor's note: This story was last updated at 9:55 p.m. Tuesday, Nov. 6, 2018, with comments from Leah Vukmir.